When your cruise ship docks in Hong Kong, take a walking tour of the fascinating Sheung Wan district with a knowledgeable guide. Learn about the history of Hong Kong as you see traditional architecture and new development that stands right next door. The well-preserved district provides a window into Hong Kong's past and present, with plenty of heritage buildings, art galleries, specialty boutiques and tasty treats to discover. Your shore excursion includes a ride on a traditional tram and a sampling of delicious Hong Kong snacks. Your guide meets you at your cruise ship's dock and takes you to your first destination, a tram from the early 1900s. Step on board to ride the tram and imagine the Hong Kong of last century. Then disembark at Sheung Wan and being your walking tour on Bonham Road. Check out street vendors that sell dried squid and other seafood, then cross over to Cat Street where you can find bargains at the many galleries and antique shops. Make your way to Hollywood Road to peruse shops that carry historical artifacts, Chinese furniture and porcelain wares. 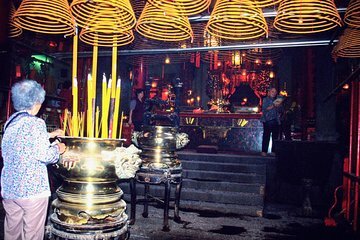 Then stop in the largest Man Mo Temple in Hong Kong, decorated with large incense spirals hanging from the ceilings and images of Chinese deities. Leaving the temple, check out a feat of engineering: the world’s longest covered escalator — the Central Escalator, which measures 2,500 feet (800 meters) long and transports people around hilly Hong Kong. After a spin on the escalator, step into one of Hong Kong’s oldest food markets. Taste delicious Southeast Asian fruits such as rambutan, mangosteen or durian, then head into Cha Chaan Teng, a cafe that serves up tasty traditional Chinese snacks such as egg custard and milk tea. Your authentic experience of Hong Kong winds down as your guide escorts you back to your ship. Worry-free Shore Excursion:We will ensure your timely return to the Hong Kong cruise port for this activity. In the rare event your ship has departed, we will arrange for transportation to the next port-of-call. If your ship is delayed and you are unable to attend this activity, your money will be refunded. See the terms and conditions for full details.